Today is internationally recognized as World Refugee Day. It is a day designated specifically to remember the significant challenges faced by those forced to flee their homes under threat of violence or persecution; and consequently, to raise awareness of how we can take part in easing this overwhelming burden. The U.N. estimates that the refugee crisis affected approximately 42.5 million people worldwide in 2011, which includes refugees, internally displaced persons, and individuals seeking asylum. This number is catastrophic, and each tells the story of brokenness and heartache. Whether spurred by a devastating famine like the continuing crisis in the Horn of Africa, or caused by cultural and political upheaval similar to the current conflict in Syria, the fear and uncertainty are profound, overwhelming, and constant. 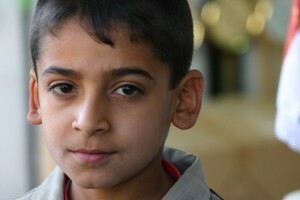 The U.N. High Commissioner for Refugees commented that “2011 saw suffering on an epic scale. For so many lives to have been thrown into turmoil over so short a space of time means enormous personal cost for all who were affected.” For those experiencing these unimaginable circumstances, we must offer our prayers and our help. At this very moment, World Help is in the midst of responding to the refugee crisis escalating in Syria through our humanitarian aid network, providing life-saving supplies for those who have lost everything. Our contacts on the ground tell us that the situation is growing worse as nearly 100,000 Syrian refugees have fled for their lives, only narrowly escaping the violence erupting across the country. The death toll has climbed to nearly 13,000 since the uprising began in March 2011, with a significant portion of the victims being women and children. There have even been some horrifying reports of children being kidnapped, tortured, and used as human shields during the fighting. [In Damascus,] the two opposing armies are breaking into apartments and sometimes making holes in the walls in order to easily go from apartment to apartment or from one building to another, to make fighting easier. Basically, housing is being stolen by both sides of the conflict. These families are not only losing their homes and their livelihoods, they are losing loved ones—mothers, fathers, siblings . . . even their own children. They have been displaced physically and emotionally, carrying with them a demoralizing heaviness that accompanies those who have been robbed of everything they hold dear. We must help carry their burden. Please help make an immediate difference in the lives of Syrian refugees by sending a gift of any amount toward these vital provisions, which include food, medical supplies, blankets, and hygiene items. Together, we can honor and serve those who have no home by becoming a small semblance of what a home is: a sanctuary and a comfort . . . a place where people care for one another, even in the darkest of times. Join us in actively remembering the world’s refugees by giving to those affected by the Syrian conflict.